Giving someone a digital gift used to be the last refuge of procrastinators and people who didn’t glance at a calendar until December 23 or so. The shelves at the local megamall have been picked clean, the clerk manning the UPS desk won’t stop laughing at you, and only your sense of pride is stopping you from scrawling “IOU: One present” on a scrap of paper—that’s when it’s time to print out the ol’ iTunes gift certificate. That’s no longer the case. In this day and age, when entire TV series can be had with the click of a Download button instead of cluttering up your shelves with discs, cases, and other items that could just as easily live in the cloud, digital gifts are no longer the present of last resort. These days, a downloadable movie, album, or TV show—or a virtual gift card that allows your family and friends to pick out their own present—may be at the top of your gift-giving list. But just because digital content has become more ubiquitous and sought-after doesn’t mean it’s always intuitive what you can and can’t give and when that gift will find its way into the waiting arms of your recipient. Whether you’re wrapping up your holiday shopping now or waiting until the very last second to settle on presents, here’s a rundown of what to expect when you stroll down the virtual aisles of online stores to pick up a digital item or two. This may be the product of more than a decade’s worth of chronicling Apple’s assorted comings and goings, but for my money, the iTunes Store provides one of the better experiences if you prefer giving digital gifts. For one thing, there’s the extensive selection—Apple lets you gift specific movies, TV shows, music, and apps in addition to sending gift cards for a wide range of amounts. 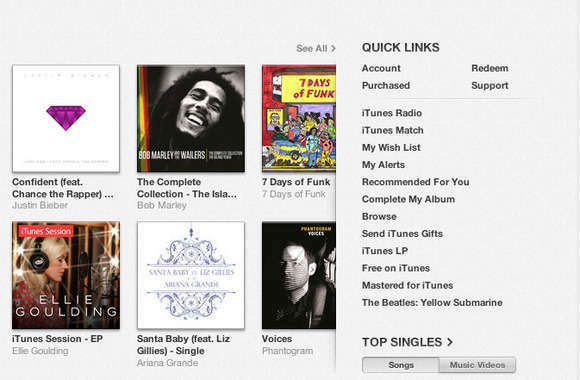 And you don’t have to search all that hard to give the gift of downloads: There’s a Send iTunes Gifts link prominently displayed in the Quick Links section on the right side of the iTunes Store’s home page. Click that link, and you get right down to business, with a pop-up window that lets you pick a recipient, set a value (from $10 to $100, with an Other option available), and write a message containing as much sentiment as 200 characters can allow. More important, you can set when the recipient receives your gift—your options are immediately or at a date of your choosing. (Apple doesn’t let you set the time, so if you’re like me, and hand out gifts to your family at night on Christmas Eve, you had best keep loved ones away from their email account during the day.) You then choose a gift card design, confirm your purchase, and revel in the fact that it’s more blessed to give than receive. Apple’s gift-giving page will also helpfully warn you that you can only give digital gift cards to people who live in the same country, so I’d better come up with alternative plans for all those Canadians on my shopping list. Not only can you set the amount of gift cards ordered through the iTunes Store, you can also schedule when they’re delivered. If you have a more specific gift in mind—say that HD copy of The World’s End or the previous season of Downton Abbey—just click the triangle next to the Buy link; that will bring a gift option where, again, you can select exactly when that digital download appears in your recipient’s inbox. When we originally posted this article in the early days of December, digitals books were excluded from this gift-giving routine, but Apple reversed course on that; as of December 16, you can now give specific digital books as gifts, much to the joy of bookworms everywhere. If you think it’s a tad impersonal to direct someone to their inbox to find their holiday present from you, you may be out of luck. 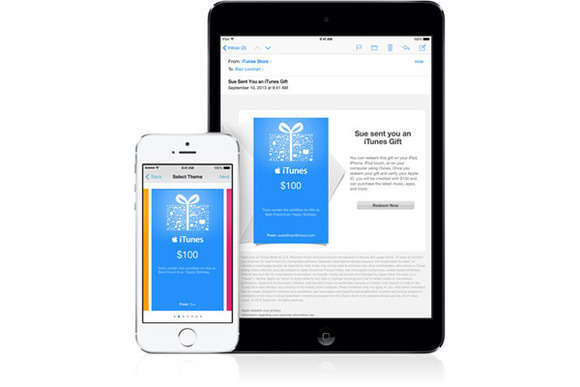 Apple used to give you the option of printing out a gift certificate you bought online, but that option has disappeared from the iTunes Store. Is there a specific movie, TV show, album, song, book, or app you want to give to someone? Click the triangle next to the Buy button in iTunes to see the gift options. It’s also worth noting that the Mac App Store doesn’t share the giving spirit you’ll find in iTunes. There’s no way to gift a Mac app in that store, and you can’t purchase any sort of electronic gift card. For that, you’ll need to head back to iTunes, buy an iTunes gift card, and hope that your lucky recipient redeems it on Mac apps instead of blowing it all on the new Britney Spears LP. If iTunes isn’t your jam, you can also buy gift cards from Apple’s online store. For a mobile platform that makes a big deal about how open it is, Android is decidedly less accommodating when it comes to your gift purchases. Unlike your iOS-using friends, you cannot give away specific apps, songs, movies, or TV shows. Google Play will let you buy gift cards, but not directly from the storefront: Instead, your first option is to type in a city or zip code to see if someone sells gift cards near you. This is hardly the way to beat holiday crowds. Scroll a little farther down that gift card page, though, and you’ll find an option for buying online; again, you’ll have to leave the confines of the Google Play store for the Target, Walmart, and Sam’s Club online stores to make your purchase. You can track down where Google Play gift cards are available, but sending them electronically is a little trickier. So where can you turn if the recipients on your list don’t own iOS devices or Macs and if Google Play’s limitations are dampening your holiday spirit? Try Amazon, which follows Apple’s lead by making it very easy to track down gift cards. (The gift card link is prominently displayed at the top of Amazon’s home page.) Amazon offers several options for delivery, including email, a printout, or a Facebook post. Order the gift card in advance of the holiday, and you can even get a physical version of the card mailed to your recipient. If you go with an electronic version of the card, Amazon lets you set your delivery date. Personalize your Amazon gift card by uploading one of your own photos. Amazon offers its own gift card designs, but you can also add a touch of personalization if you prefer. You can upload your own photo, which is a definite improvement over the pre-canned look-and-feel of a digital gift certificate. You can also create a JibJab style video—your head superimposed on a picture singing a fairly ridiculous song—but be warned that the templates aren’t really holiday-themed. Also, the production values will not exactly invite comparisons to Pixar. Amazon doesn’t let you give specific electronic items as gifts, but it gives you the option of strongly suggesting what your recipient should spend their gift card on. You can’t gift electronic versions of specific items from Amazon the way you can in Apple’s store. But you can give your recipient a pretty good hint as to what you hope they’ll download on your dime. The retailer’s eGift an Item feature lets you select a picture of the gift you had in mind, whether it’s a digital download or a physical item. The recipient is under no obligation to download that particular item, but until the flying Amazon gift drones can deliver your present in person, it’s probably the closest you’ll come to imposing your digital will on someone else. If someone in your circle of family and friends owns a Nook tablet, you’ve got some electronic gift-giving options. Barnes & Noble allows you to gift both books and apps for its tablet; just click on the “Buy As Gift” option next to the Buy Now button. Barnes & Noble also lets you send digital gift cards, though there doesn’t seem to be a way to pick a delivery date. 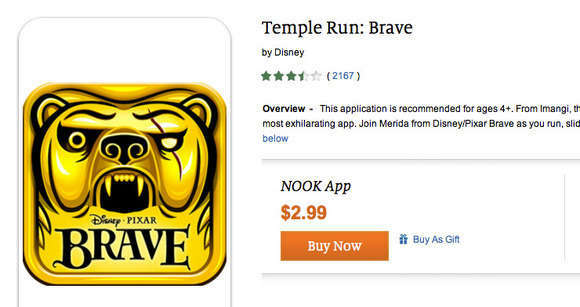 As with iTunes, you can gift specific apps for the Nook tablet. Options are decidedly more limited for the Windows 8 device user in your life. You can buy a Windows Store gift card from Microsoft’s store, but the cards are sent to a physical address, not delivered electronically. Some good news: In addition to offering Windows Store cards, Microsoft also sells Xbox gift cards in case you’ve got a gamer in need of a gift in your life. Subscription services also provide a gift-giving opportunity. Popular streaming music services Pandora, Rdio, and Spotify all offer gift card options, while ebook subscription service Scribd recently unveiled customizable gift subscriptions. Poke around the site of the subscription service of your choice, and there’s likely to be a way to give that service as a gift. This article was updated on December 17 to reflect that Apple now lets you give books as digital gifts via iTunes.